Born of the perpetual one-upping of European aristocrats, the exotic "Super Car" market has been a difficult target for any new contenders. History and general opinion show that if you you're new, and an American, you already have two strikes against you. So how does American muscle compete with these European glamour machines? What is the perfect style, luxury, and performance ratio? And how do we break the assumption that America doesn't make Super Cars? Like the leaves on an autumn roadway, the standards of the modern Super Car are blown away as America's new contender drives by. On behalf of the American people, I would like to formally submit the Falcon F7 to join the ranks of the Exotic Super Car Elite. I've test driven the prototype, beta, and production models of the Falcon F7. In an effort to test the cruising comfort and performance of the F7, I tested both conservative and aggressive driving styles. I visited Falcon Motor Sports on multiple occasions to see the manufacturing process and see what they're up to. What good is a stylish super car without an awesome sound to turn some heads? 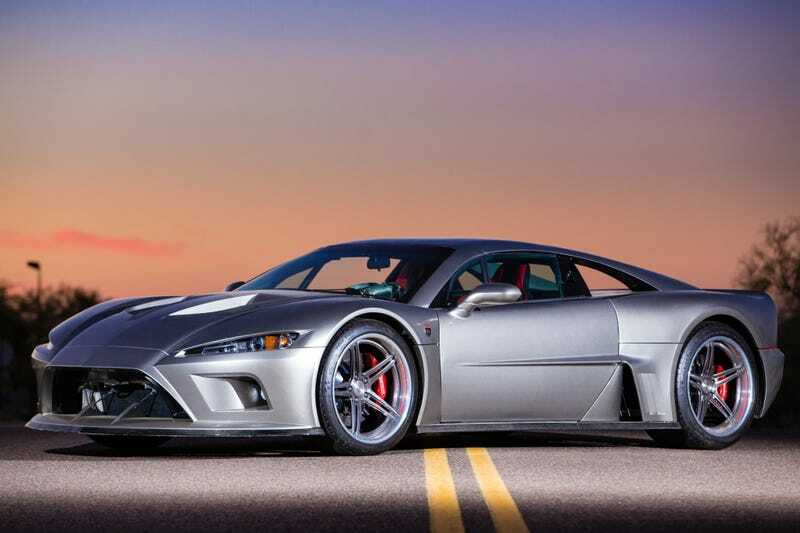 Without a doubt, the Falcon F7 sounds like a high performance machine. When compared to its European competition, I'd have to say that the F7 has a clear advantage. It's been through puberty. There's some noise pollution from the racetrack nearby, you really hear the F7 about 6 or 7 seconds into the video. Falcon Motor Sports is located just 40 minutes from Detroit Motor City. A city founded by innovative automotive design and the hub of automotive knowledge for the last 100 years. The Falcon F7 is assembled piece by piece by skilled craftsman with a wealth of knowledge, experience, and an unparalleled attention to detail. These guys are passionate about what they do. Their fathers were car guys and their kids will be too. While test driving the F7, I must confess... There were a few times when I exceeded the posted speed limit... Yes, yes I know. It's hard to believe. Against my better judgement, I gave in to the vehicle's constant begging "Please, please! Let me show you what I've got! STOMP IT!" Far in the distance, I saw a Pontiac G6 to my right. He was preparing to make a left turn. Due to the speed at which I was traveling, his judgement was off. He pulled out, not anticipating that I would be approaching so quickly. As my foot hit the brake pedal, the controlled deceleration of the Falcon was like nothing I've ever felt before. No skidding, no hesitation. Just a strong, calm deceleration that was better than I could have hoped for. In addition to being a rare sight on the roadway, each Falcon F7 is built with a personal touch. It's common to see Falcon customers in the assembly area. Poking around, asking questions, and watching with anticipation as their new F7 takes shape. The F7 has taken a step in a bold direction with the layout of the interior. Designed to feel like the cockpit of a racing machine, it breaks the mold of the standard dashboard instrument panel by creating a driver encapsulating effect. The F7's appeal to auto enthusiasts holds true with additional interior details. One example is the throttle body air vents. The Falcon F7 handles like you're driving on rails. The high performance Penske push-rod suspension delivers amazing responsive feedback. A few minutes of "seeing what its got" provides you with a level of driving confidence that's uncommon in these high powered super cars. 3: Light Weight - Aluminum, Carbon Fiber, Kevlar. The Falcon F7 was built to be light... Very light. Depending on the variation you choose, the Falcon F7 can weigh anywhere from 2750 - 2900 lbs. 2: 1100 Horsepower, Twin Turbo, Intercooled Manifold, Lingenfelter Performance Engine or 620HP Naturally Aspirated Performance Engine. In my opinion, the Falcon F7 looks like a bad-boy version of the modern Super Car. Take the meanest looking Ferrari's, Lamborghini's, Corvettes, and Vipers, mix them all together, and then send the resulting car to Chuck Norris Black Ops military training. The result would be the Falcon F7. The Falcon F7 - IT EXISTS! Originally posted on johnny-robot.com - 10 Reasons why the Falcon F7 is Awesome Sauce.